Product weight 10 lbs. 12 oz. What is a "sit-stand stool"? A sit-stand stool is a versatile seat that you can use to be more mobile at your desk. Ergonomists recommend that you vary up your posture throughout your day, and don't spend too much time in your chair. But, it can sometimes be difficult to do consistently. A stool will give you something to lean or perch on while taking pressure off your legs and feet, to help you stand more without getting tired. Can I use this stool work with a height adjustable desk? Yes! The E3 Donut goes from 24.2" (at the lowest) to 30.1" (at the highest), giving it the range you need to use it at both sitting and standing heights. It is designed to work alongside our UPLIFT Desks. I'm a tall user. Will this work for me? The E3 Donut Stool is intended for users up to 6'3" tall. It will suit most individuals. Is this a good replacement for my normal office chair? We've designed the E3 to be very comfortable. However, nothing can fully replace having a supportive back and a form-fitting seat. Sit stand stools are intended to supplement more traditional seating, not completely replace it. Is this similar to your Motion or E7 Stools? 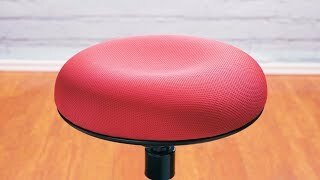 All of our ergonomic stools are designed to provide unique seating experiences, but the Donut's plush seat features a different design with a center divot that supports the tailbone, which differs from the seats on the Motion and E7. This stool's pivot cap design allows you to move from side to side and front to back, because movement is generated from under the seat and not from the base. Looking for tilt from the base? Give the Motion Stool or E7 Stool a try! Will my kids fit on this stool? Depending on their height, maybe. This stool suits users ranging from 5'1" to 6'3", which means it will fit middle school and high school kids more than it will elementary aged kids (it is a bit tall for most children). But we have some other options that are designed with smaller kids in mind. Check out our line of kids stools here. Can I use the Donut Stool on carpet? What about hardwood? Yes, the E3 Donut Stool is designed to work on both hard and soft flooring, which includes hardwood, concrete, tile, and most types of carpet.